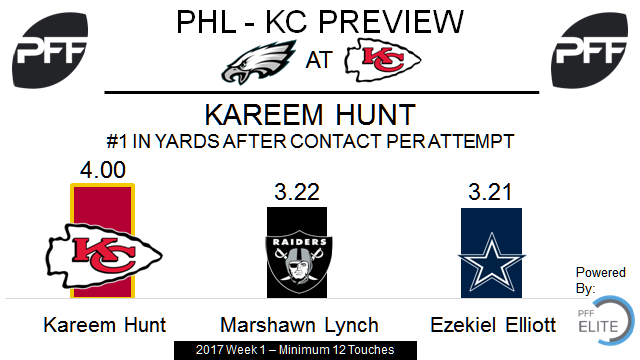 QB Carson Wentz vs. Chiefs cornerbacks – Wentz was solid in his 2017 debut, and will be a key factor if the Eagles are able to pull off their second straight road victory. The sophomore had a 77.8 adjusted completion percentage against Washington last week, but was 0-for-5 on deep passes after completing a 58-yard touchdown pass to Nelson Agholor on the team’s opening drive. Wentz will face a stiff test from Kansas City’s secondary, led by Marcus Peters. The third-year defensive back earned an 81.4 grade against the Patriots on opening day and was largely avoided by Tom Brady. Peters was only targeted once on 45 coverage snaps. Wentz may have an easier time targeting Terrence Mitchell and Phillip Gaines on Sunday. Mitchell allowed 96 yards on four catches last week (albeit on 11 targets), while Gaines allowed three receptions on five targets for 47 yards against New England. 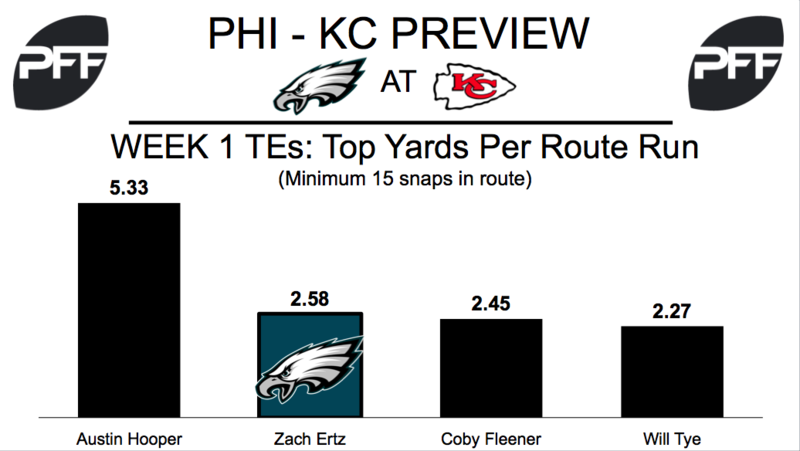 TE Zach Ertz vs. S Daniel Sorensen – Ertz was the Eagles’ highest graded offensive player last week (84.3 grade), catching all eight of his targets for 93 yards. Carson Wentz had a 115.1 passer rating when throwing to his tight end. With stud safety Eric Berry (Achilles) out for the season, Daniel Sorensen is the next man up. Primarily a special teamer and third safety, Sorensen played a career-high 571 snaps on defense in 2016, earning a 70.6 overall grade. The two veterans will be matched up on a number of plays, creating a potential mismatch for Wentz to target. T Lane Johnson vs. EDGE Justin Houston – Philadelphia’s right tackle allowed one sack and one hit on 44 pass-block snaps last week against Washington. His 96.0 pass-block efficiency ranked him 29th out of 62 offensive tackles in Week 1. This week, Johnson will have his hands full against the Chiefs’ top pass-rusher, who rushes primary from the left side. Houston abused the Patriots’ offensive line on opening night, accumulating six total pressures (including two sacks). His 17.9 pass-rush productivity was tops among 3-4 outside linebackers. RB Kareem Hunt vs. LB Jordan Hicks – Hunt exploded in his NFL debut last week against New England, topping all running backs in Week 1 with eight missed tackles forced and 4.00 yards after contact per attempt. He was also unstoppable in the passing game, catching all five of his targets and leading all backs that ran a minimum of 10 routes in yards per route run at 5.76. After his rookie season was cut short by injury, Hicks excelled in 2016 with an 87.1 PFF grade that was sixth among linebackers. He had the second best yards per cover snap among linebackers with 200-plus snaps in coverage at 0.39. T Mitchell Schwartz vs EDGE Brandon Graham – Last week against Washington, Graham lined up on the left side on 42 of 43 snaps, so Schwartz will be given the task of stopping him this week. In 2016 Schwartz allowed 33 total pressures in 601 pass block snaps, and his nine sacks allowed was tied for the most of any offensive lineman. Graham had just six sacks last season, but his 83 total pressures was the third most in the NFL in 2016. He ranked fifth in PFF pass-rushing productivity among all edge defenders (pressure created on a per snap basis with weighting toward sacks). WR Tyreek Hill vs CBs Jalen Mills/Patrick Robinson – The injury to cornerback Ronald Darby will leave the Eagles with Mills and Robinson to try to slow down Hill. Last week Hill’s 4.16 yards per route run was third among wide receivers that ran 20-plus routes, and the passer rating on throws to him was a perfect 158.3. Mills was targeted a league high 15 times in Week 1, and he allowed ten catches for 108 yards with one interception. Robinson only gave up two receptions for 11 yards against Washington, and his 0.27 yards per cover snap was 15th of the 71 cornerbacks with a minimum of 25 cover snaps last week.